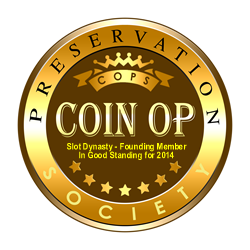 Most seasoned coin-op collectors that have been in this hobby for a reasonable amount of time, are well aware of the many reproduction Slot Machines that have been flooding the market for many years. Even tho a couple were being done as early as the late 70’s, the brunt of it all started in the mid-80’s. There were even a handful of Trade Stimulators that have been repro’d in the past. The people that get hurt the most with these Bogus machines, are the new collectors that have been coming into the hobby on a regular basis. Ever since eBay began, it opened up a whole new market, for distribution of phoney’s, to unsuspecting buyers that have not done their homework before bidding. It has now become time to inform collectors of the many Bogus Trade Stimulators. Most of which that have been showing up in the past few years. The following, are a small number of examples. Groetchen “TAVERN” ----- Several years ago, there weren’t many Tavern’s known in collections. Now there are a very large number. Many of which are being made up from other models. Groetchen made several different machine variations, using the same case style. Four of them have removable cast name plates on the top casting – “Tavern”, “Ball Gum”, “The Bartender”, and “The Fortune Teller”. The others have the name as part of the top casting – Most of which are the “Penny Smoke”, and another variation with “Ball Gum”. What is being done to make up the phoney Tavern, is either the removal of the other Ball Gum plate, or milling the cast-in name off the others, to make a smooth area for the new recast Tavern nameplate. Also, the Tavern was only produced with the front casting having a 3 vertical bar design to the right of the award card area. Some have shown up with the flowery broach design to the right, and most of that design had the award card frame as part of the front casting, and was not the removable 4 screw frame style. Then of coarse, they will all have reproduction reel strips & award cards. These phoney’s are only being done to demand a higher price for the more popular Tavern model. I have even talked to three of our seasoned collectors, that have been snookered with a phoney. Two have the wrong front casting, that was only on the "Little Prince" variation. Groetchen “BALL GUM” ----- Beginning May 1, 2011, yet another BOGUS model has hit the eBay market. The standard Groetchen "Ball Gum", with the cast-in marquee lettering, with a phoney re-cast, and cut-down Jackpot, from a Pace Mfr. machine. Note: These Groetchen models NEVER came from the factory this way. Nor has a previous operator ever changed them. Buckley “BALL GUM” ----- Most of these are being made up from the more common “Cent-A-Pack” model. The etched nameplate, which is pinned to the top casting, is removed. All of these models say “Ball Gum” in the casting, under the plate. Then a recast large jackpot is mounted on the front. The original set of cigarette strips & card are removed, and a set of repro fruit symbol strips installed. Now you have the more desirable Buckley “Jackpot Ball Gum”, to rake in the higher figure. Also, an original model will not have the 4 holes in the top casting where the other nameplates were pinned. This same Buckley machine is also being transformed into two other Bogus models. The original fruit or cigarette strips & card are removed, and a set of Tavern beer strips are installed, along with a made-up award card, with either the Bartender or Bar Boy name placed on it. NO Buckley machine was EVER produced like this. About 3 or 4 have sold on eBay, and others at VCA auctions. One eBay buyer made the seller take the machine back. Garden City “BAR BOY” ----- These are being done by removing the cast “Gem” nameplate, and replacing with a recast “Bar Boy” plate. The original cigarette strips & award card is removed, and cut-up reworked repro "Tavern" reel strips are replaced. These Tavern strips are nothing like the original beer symbol strips that were original to the Bar Boy. Besides, the Bar Boy is a 4 reel machine, and had an odds reel. The Gem is a 3 reeler It's a real shame that some of the "GEM" machines that have been bastardized to do this, were excellent originals. A true collector knows what this does to the hobby. All of the Phoney 3 reel Bar Boy's are painted Red. A color that this machine never left the factory with.Three Victorian Casino Auctions have had one of these junkers in it. Groetchen “SPARKS” with the star pattern front casting ----- I have seen a couple of these with repro cut-up Tavern strips as well. Some of these models did have beer symbol strips, but they are slightly different, as the Sparks reels are a smaller diameter than the Tavern. So, you don’t just take a single snip out of the longer strip, and hope that the symbols will line up. It’s not that simple. Another big clue as to what has been going on, is most all of the original reel strips, nameplates, etc., that have been taken off these perfectly good original machines, have also been auction’d on eBay. This is only good, for a collector that has a machine with missing parts, but doesn’t mend the sore of bastardizing a perfectly good original machine to do so. Dice Machines ----- I have even seen a made-up wood case dice machine, with a phoney top card, on eBay, and even had the audacity to put an Exibit Supply decal on the case, to try and make it look factory. The latest Bogus Fantasy machines are being made up from the popular Caille "Jr. Bell - Ball Gum". (Both wood front & cast front models). Also, the Burnham & Mills "Dandy Vender", and similar models by other mfrs., like Superior, Rockola, etc. What is being done with these models, is the original strips & cards are removed, along with the original cast Ball Gum marquee, and replaced with a recast "Base Ball" marquee from another mfrs. machine. Then made-up-from-scratch BaseBall reel strips & award cards that another collector made up for him, that Never came on these machines. A couple of these Creations have even had repro decals placed on the sides, that only came on the Gottlieb & Peo "Miniature BaseBall" ball shooters. Needless to say, they are way-out-of-place on the sides. Then much of the trim paint is done in green, which was also never used on these machines. Three or four of the Caille "Jr. Bell" machines that were Bastardized, were purchased as excellent original machines on eBay, and VCA auctions. There are not that many of the early models, in excellent original condition, and this Clown has to completely Destroy them. Also, another Bogus machine that just hit the market, is a Fantasy "Base Ball" creation. It was originally a Peo machine, that had the Whirlball playfield removed, and placed on eBay, then installed a recast playfield from the highly reproduced Pace Base Ball. Then added a marquee casting from a Superior machine, with a made-up Base Ball paper, and then painted way-too-much of the castings, with his famous green paint, and added phoney lettering all over the machine, as well as a Pace decal, which does not belong, as it is a Peo machine. We need to get the word out to as many new collectors as possible, so that they do not loose interest in the hobby before they even get started. I have personally talked to several people that have been snookered with Bogus counter games, and were going to get out of the hobby. One was a Penny Drop. We don’t need this happening to anyone. Additional Bogus & Repro counter machines, will be listed here as they come in. Trade Stimulators & Counter Games that have been reproduced. Clawson "Lively Cigar Seller No.1"
Here is a small sampling of the many Slot Machines that have been reproduced over the years. Some started as early as the 1970's. Mills (cast iron) "Liberty Bell"
Bill I'm not bidding on this but is this a Groetchen Tavern? cpdretired wrote: Bill I'm not bidding on this but is this a Groetchen Tavern? Hi Ron: No, this is just a Groetchen "Ball Gum" w/Tavern Beer strips and card. It appears to be original, as the factory made many different configurations with all the case styles. Also, operators would make changes to their machines on location, when the player attention slowed down. Usually when a newer machine wasn't available yet. Hopefully a serious collector will purchase this, and not let it get in the hands of "Mr. Bogus Builder", that manages to Bastardize most everything that gets into his possession. It would surely get the name milled out of the top casting, to lay in the recast Tavern nameplate. Collectors Beware: There is yet another BOGUS trade stimulator that has shown up on eBay. It is item #221062287929. Just a few weeks ago, this was a perfectly good original Caille "Jr. Bell", that has now been bastardized. This is the early model case that was only made by Caille. It only came with fruit symbol reel strips & award card. Later model cases by Caille, Burnham & Mills, Rockola, and others, did have other strips & cards, but not this model. The original "Ball Gum" Marquee, Reel Strips, and Award Card were taken out of this machine, and were sold on eBay just a couple of weeks ago. The aluminum castings have been polished, and a hidious green painted on them. Only red & black trim colors were ever used at the factory. A new recast marquee has been replaced from a later style, with a homemade card, with Wisconsin Novelty name on it. They were only jobbers, and never made these machines. It is also mounted at an incorrect position. Made-up Repro Baseball reel strips & award card were installed, as well as the red strip in the gumball compartment window. The award card is not a copy from an original, because they never made one that looked like this. Those ugly swirl-colored marbles in the upper display window, were also never-ever used by any manufacturer. Only solid-colored ones were placed in a handfull of models, like from Daval and Groetchen. The brass plate tacked on the lower front is original, and was placed on many of this model by the jobber, Wisconsin Novelty. The coin door on the rear of the case, is the correct one, with the Caille Bros. lettering. The serial number on this machine is 1592, which I already had in my files from a previous owner. Also beware of another BOGUS example of this same model showing up later, because a second set of original reel strips & award card, were also sold on eBay. In addition, there has also been two sets of original reel strips & award cards sold on eBay, that were removed from two different Superior "Cigarette Ball Gum" machines. Those two machines will surely hit the auction scene soon, made up as "Who Knows What" configuration. There are many new collectors in our hobby, that have been snookered by this phoney crap, in the past 5 to 6 years, and the ones that I have talked to, are not 'happy campers'. Most have heard from other collectors about what they had purchased, before contacting me for advise. Many of these phoney made-up models, are placed in the VCA auctions, every session. Please do your homework before bidding on any coin-op machines. If anyone cares to dispute anything I have said above, please feel free to contact me. I do know what I am talking about, and DO NOT like seeing our collectors getting BURNED by the GREEDY. What happens in Vegas should stay in Vegas. The Bentcoin does it again. Yes, I saw the sad news this afternoon. Feel sorry for the chap that took the bait. Bill I will hunt him down at the next show. Our friend is a nice person to talk with but I don't like what he does. As sorry as you feel for that guy you have to feel even worse for the guy who paid $2,875 for the rubber Rock-Ola Official Sweepstakes horse race trade stimulator at the VCA auction in May.